I have noticed that most people fail to utilize the corners of kitchens effectively. In most traditional kitchens, the corners mostly consist of shelves in which there are different types of spices, cereals, etc. But in the recent modular kitchens, these corner spaces are utilized in a much better way. Even though designing your kitchen is not a hard thing, utilizing these small corners effectively is. And this the primary reason because of which these corner storage units have been introduced recently. These corner storage units are specifically designed to use that corner spaces in a way that is appealing and helps you keep your accessories in a more organized way. But that’s not it, the biggest thing that bothers most people, is the cost of these storage units and the materials that they are made. Because let’s are honest here, if they are not durable, then they are not worth the price you are paying for. The first annoying thing that happens when you enter that kitchen accessory store, is the salesmen that will keep you bothering by explaining different features about that storage unit, and why it is the best one for you. And before you know it, you will end up purchasing something completely different than what you need. So before you go into that accessory store to finally purchase these storage units, it is best to have complete knowledge about those so that you will be looking exactly what you need, and nothing else. As the name suggests, it will reveal all your accessories or other things as soon as you open that cupboard. 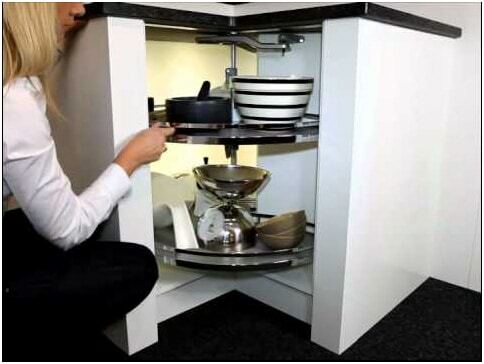 This storage unit can fit in almost any type and size of a kitchen, which is a good thing. 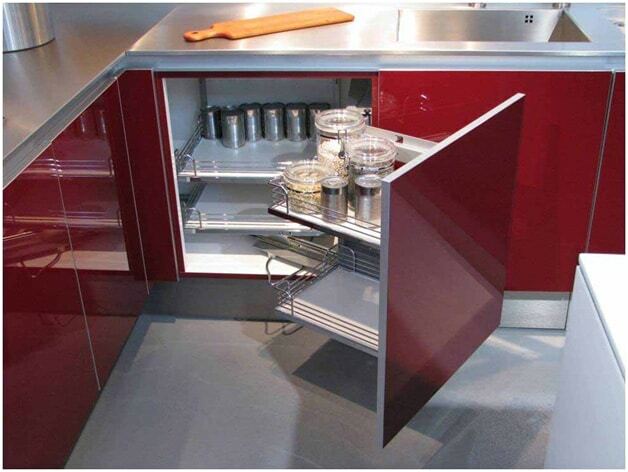 This unit cleverly utilizes the storage space available and that it leaves nothing unused. 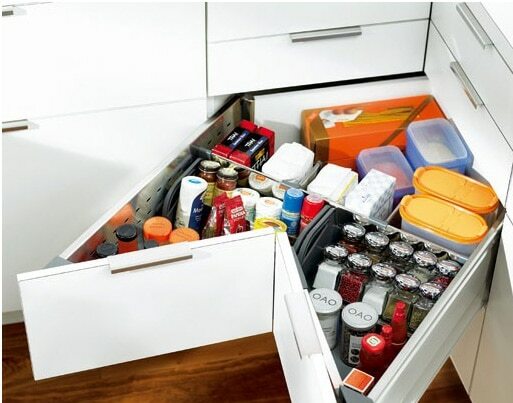 The contents that you will need most of the time, can be kept on the door itself while keeping the contents that are moderately used inside the cupboard. 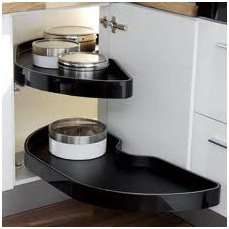 Another great thing about this storage is that it comes in various sizes depending on the corner space that you have. This storage unit really pops out as soon as you open the door. It is mostly used to keep all your pots and pans in a decent and systematic way so that they are not just lying in random places in your kitchen. This unit is designed in the form of layers that are one above the other. Another great thing about these layers is that they can handle up to 20kg of weight, which is awesome. One thing that makes these storage units sell, is that they just pop out when you open the cabinet door. This will prevent you from having to bend over to remove or keep anything. The version is slightly different from the one that I mentioned above. And the only difference in it is the number of layers. This version is specifically designed for kitchens that are smaller. Nothing else is different. The height of this storage unit is short as compared to the previous one, and it too can handle weights up to 20kg. This one is expensive as compared to the previous storage units, but if you don’t care about the price and you just want to utilize the space that is available to you, then this one is the best. 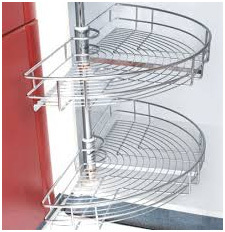 This storage unit is the best kitchenware invention because it does not leave any inch that is unused. These storage units offer the ¾ space of a whole circle because you will need to shut the door after taking your required item from it. One great thing about this storage is that it swings the layers out of the shelve so that you can have easier access to all the items. This one is slightly different from the ¾ storage unit mentioned above. This one actually comes out and spins all the items as soon as you open the door of the shelve. Another thing about this storage unit is that it offers a complete circle for you to store things on it. Consider this one as the successor to the previous ¾ storage unit. If you really like storage units that can twist and give you better access to your items, as well as giving a better look, then this one is for you. Even though it is a small carousel, it can store many things, such as small crockeries, spices, cups, etc. And since it is a small storage unit, it can only store small things. This storage unit has recently been introduced into the kitchenware market, and I have to say that it is awesome. It utilizes every space that is available under your counter, and you can pull out the whole tray for easier access to items. One thing that you need to notice, is that there is no space used by shelves around this storage unit. 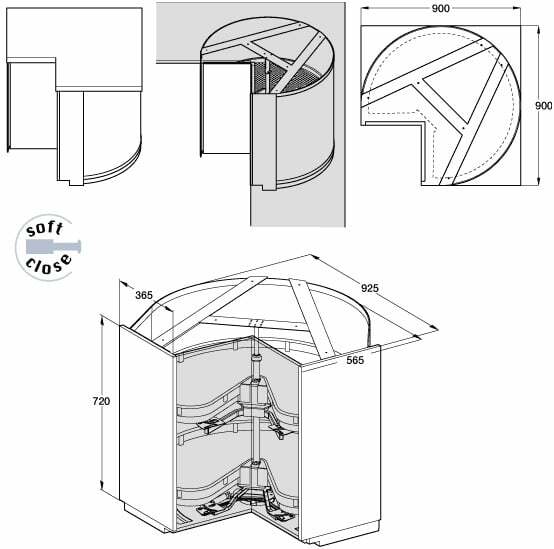 This is another great revolving storage unit that will give a much easier access to all the items that you place in it. One great thing that becomes the highlight of this storage unit, is that it provides a base that prevents the things from slipping. It is great for pans, and pots that might slip while rotating this unit. These are the latest corner storage units that are available to us at the moment. You can select any one of these, and if you want, you can do a deeper research on it through the internet. It is always best to do a thorough research about the items that you will be purchasing before actually going into the store to purchase them. Once you step into that Kitchen accessory store, you will notice that there are various brands/companies offering the same type of storage units. Many salesmen and stores make this buying process much more complex for you because they want to sell the items that make them more profit than others. But you should make sure that you know exactly what you need, and that you are purchasing that item only. Here are some tips that can help you simplify this process, and look for exactly what you want. 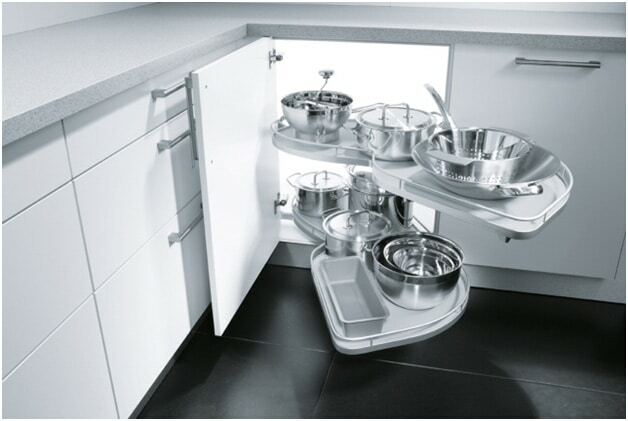 You are looking for a solution that will provide you better storage option in the corner of your kitchen. This is the place which is hard to reach for items, so you should be looking for something that will provide you easier access to all your items, while at the same time, providing maximum storage capacity. This is important because you don’t want to break the layers of your storage unit, right? You will have to decide what items you will be keeping in that corner storage unit, and then choose one accordingly. If you are not able to decide, then you should go for something that can hold random items, such as te Le Mans storage unit, or the Twister. As I mentioned above, these storage units should fulfill your purpose while at the same time, they should look fancy. This might even cost you some more money, but there are really great storage units, such as the Revo Carousel or The Magic Corner that will add that extra touch to your kitchen. It doesn’t matter what the salesman recommends you, or what storage unit you saw in that commercial. 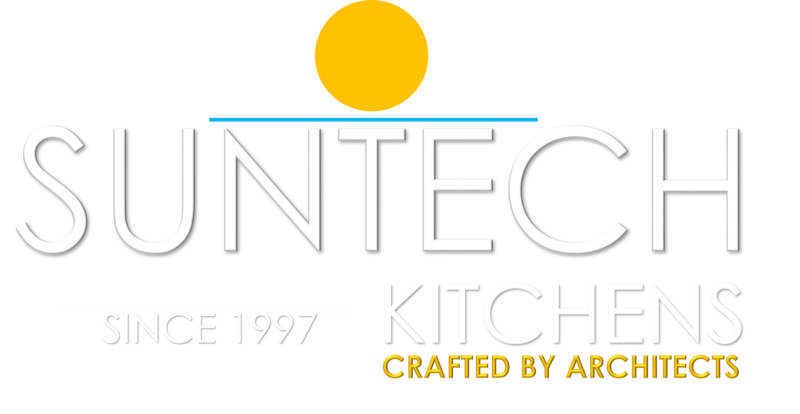 You should focus on having the things that will fulfill your purpose and make your kitchen look more elegant. So make sure that you rethink and decide what kind of storage unit you want. This is important because most people don’t even decide their budget and simply hop into the store to purchase these units. You should have a budget, and that you should look for units that fall into that budget. All of the storage units mentioned in this article are made with stainless steel and are dent free, and corrosion free. This ensures that you will get the best bang for your buck.